The 10 Best Buffets in Utah! 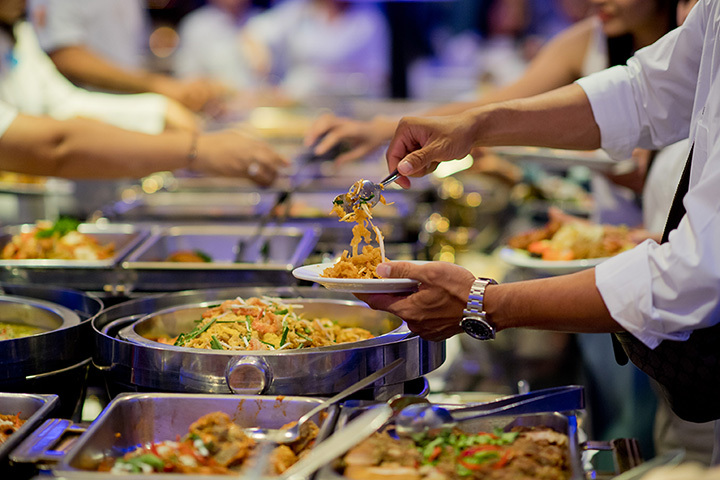 Buffets: The place to go when you’re hungry and just want to try a little bit of everything. In Utah, diners will find a range of delicious buffets serving up everything from authentic Indian dishes to Italian favorites. Whatever your stomach is rumbling for, you’ll find it at the 10 best buffets in Utah. When you think of buffets, Indian food may not be the first thing you imagine. With locations in Midvale, Park City, and American Fork, its apparent that Ganesh Indian Cuisine has been attracting a hefty crowd of hungry Utahans for quite some time. The restaurant’s most popular special? The lunchtime buffet. This is great all-you-can-eat Indian food (lamb curry, chicken tikka masala, naan, etc.) at a reasonable price that will keep you coming back for more. Ahhh Indian food, how do I love thee? Let me count the ways. I love thy exotic sauces like tamarind, mint chutney, and coconut chutney. I love thy multiple ways to prepare veggies like Chana Masala, tofu, and eggplant. I love thy saffron rice and basmati rice. I love thy garlic naan bread which is always perfectly cooked. I love thy coconut soup which warms my soul. I love thy Gulab Jamun for a dessert with just the right amount of sweetness. I love thy compassionate nature because thou always hast vegetarian and vegan options. I love thy willingness to expose me to dishes and spices which open my taste buds and palate to new ways of experiencing food and love and life. I love thy ability to fill my belly without meat, dairy, eggs, or fish. I love that thy buffet is always ready to fill me up at lunch time when I don’t have a lot of time. Thy compassion is abundantly cool!! The family-owned Great China Restaurant is just as affordable as its fast-food competitors. The unlimited lunch buffet is just $7.50, drink included. Whether you’re looking to get some delicious veggies or a full plate of egg rolls and noodles, this is the place to go. Pizza Pie Café’s tagline is “Real American Pizza.” At Pizza Pie, it feels like the world is at your fingertips—a world of cheesy, garlic-y, pepperoni-laced goodness, and tantalizing dessert pizzas. But if you don’t want pizza, no problem: you can have pasta or salad (or all three!). With 10 locations in Utah, Pizza Pie Café is easy to access and a fun spot for family dinner. Just make sure you don’t leave without trying a slice of the dessert pizza of the month! Sushi Ya isn’t a buffet in the typical sense, but an all-you-can-eat sushi restaurant that functions more or less as a buffet in spirit. One entry to the restaurant will give you as much sushi as your stomach desires. Any rolls that you order and don’t eat will go on your bill, but after you taste this sushi, you won’t want to let any of it go to waste. Tucano’s is a household favorite in Utah, especially amongst those with a passion for good meat and/or the restaurant’s delicious, grilled pineapple. At Tucano’s, you have unlimited access to an enormous salad and side-dish bar, in addition to unlimited access to their meats, which servers regularly bring by your table. The secret of Tucano’s is its practice of the Brazilian tradition of grilling, known as “churrasco”—a fusion of South American and European gastronomical culture. Odds are, your conception of good meat, beans, and even salad will change after you indulge yourself at this satisfying restaurant. In some ways, King Buffet really feels like the king of all Utah buffets, especially given its incredible variety of buffet items. Every day, the restaurant offers over 300 items on its buffet bar, including an impressive selection of traditional Chinese dishes. King Buffet also has pizza and other traditional American foods in its buffet. At Chow Time Buffet and Grill, you’ll likely find anything and everything you’re craving. If you want Chinese food, fried food, seafood, southern food, Memphis-inspired barbecue, and/or cups of red and green Jello cubes, this place is for you. There’s no doubt that Chow Time is a much-needed and one-of-a-kind experience. The Kathmandu is a popular restaurant in Salt Lake City known for its Indian and Nepalese food. The restaurant is proud of the fact that when you eat at the Kathmandu, you can experience the delicacies of India and Nepal without actually having to travel to those places. Given how many people swear by the restaurant, it appears that many Utahans are also very happy about this. The restaurant’s relatively new lunch buffet creates even more incentive for people to give this place a try. The Skyroom Restaurant is an on-campus, weekday lunch buffet at Brigham Young University. Sound weird? It’s not. This place isn’t exactly a college hang-out—it’s a professional restaurant that caters to visitors, professors, university administration, and students as well. The Skyroom’s unlimited lunch buffet is $15.99, and if you eat here, odds are you won’t be needing dinner. St. George’s Garden Buffet has an impressively-sized clientele, and is easily one of the best buffets in St. George. The restaurant is clean, affordable, and its staff are friendly and attentive. Oh, and the food is delicious. What more could you ask for?